My purpose of writing this lesson is to help investors. Investors must examine all the factors that can affects the bottom line before they invest. Remember all business ventures have risk. Although I came from a poor family, I was quite clever to get a Government scholarship to study civil engineering in KL Technical College in 1953 which is currently known as UTM. After 4 years, I graduated with a diploma which was not recognised as an Engineer. I had to work and study for another 3 years to become a Chartered Civil Engineer UK. Among all the business ventures, my most successful were the founding of Mudajaya, Gamuda and IJM Corporation Bhd which has a market cap of about Rm 12 billion. Fortunately, I only had 1 business failure that is planting Orchids. Although I came from a poor family, I always like flowers and music without which life can be very monotonous and boring. When I started working as an engineer in 1957 for the Government my salary was only Rm 760 per month. Yet, every month I would buy 1 Venda orchid plant as shown below for enjoyment and investment. The Venda orchid plant can produce 1 or 2 small plants after 2 or 3 years. After 3 years, the small plant will grow to produce flowers which is similar with the parent plant. However, I can cross breed by putting the pollens from one plant onto the stigma of another plant. After about 1 year a fruit is formed and its seeds can be grown to produce plants and flowers after another 3 years. But all the flowers are not the same as the parents, some are beautiful and some are not. About 50 years ago, the Thais could produce flowers as beautiful as the parent plant by tissue culture. To cut the story short, I would not describe the technical details of tissue culture. 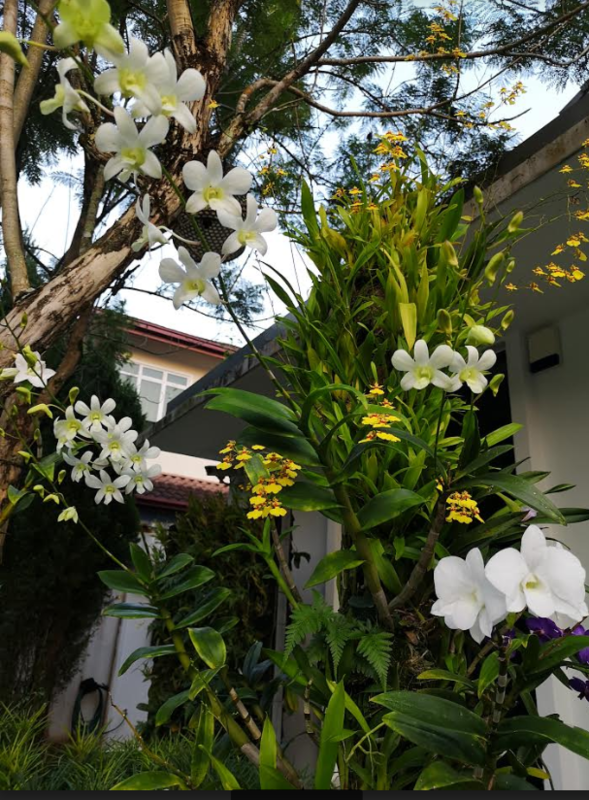 The Thais started selling flowering size white dendrobium plants at Rm 3 each. Each plant could produce 5 spray of flowers per year and every 3 years each plant could grow to become 2 plants. Wah! What a lucrative business? 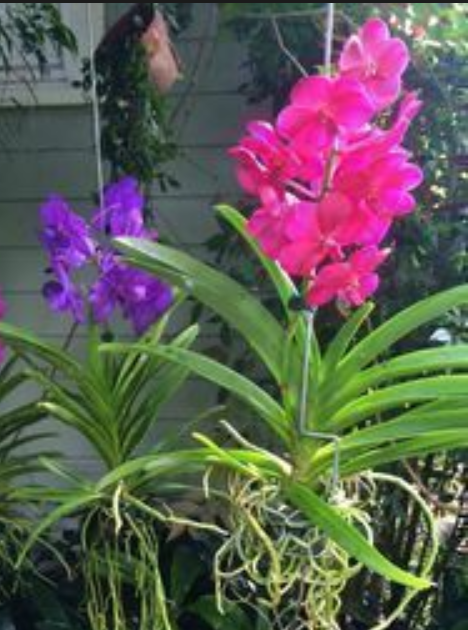 You can see these dendrobium plants below from my garden. If I bought 1 plant at Rm 3 and each plant produced 5 sprays which could be sold at Rm 1.00 per spray. Moreover, each plant could become 2 plants after 3 years. It is impossible to find another more profitable business investment. I immediately bought a piece of land of about 2 acres and constructed all the infrastructures such as water pumps, auto spray of fertilisers and fungicides etc. I registered a company called Dendrops Sdn Bhd. I imported about 500 dendrobium plants from Bangkok and employed about 10 workers. Yes, I could produce a lot of flowers. The biggest buyers of white dendrobiums were the Japanese. Unfortunately, I could not find air cargo space to export my orchids. At that time there were only one daily flight from Kl to Tokyo and all the cargo space were completely booked by the computer chip companies. My 1 box of 1,000 sprays of flowers would cost only Rm 1,000. But 1 box of computer chips of the equivalent size would cost a few hundreds thousand ringgits. The only reason I lost money is because I could not find cargo space to send my products. Lesson: I had the necessary capital, I had the know how to produce and I knew which was the best export market. But I did not know the necessity of transport of my products.